Creating Mashups in QlikView is extremely simple but I am very often surprised that QlikView’s ability to integrate QlikView documents and objects into other web application is not used very often, sometimes it is not even known that this can be achieved easily. Maybe one reason for that is that documentation and examples are very rare. That’s why I have created a very detailed documentation + examples which I am publishing now. A mashup, in web development, is a web page, or web application, that uses and combines data, presentation or functionality from two or more sources to create new services. The term implies easy, fast integration, frequently using open application programming interfaces (API) and data sources to produce enriched results that were not necessarily the original reason for producing the raw source data. What do You Need for Mashups with QlikView? How Does QlikView Support Mashups? 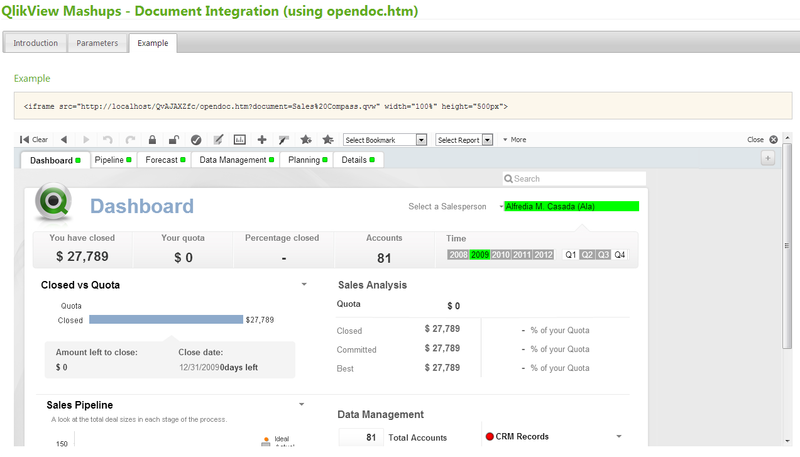 There are several parameters available to control the output from opendoc.htm or singleobject.htm. A detailed list of parameters and how thy can be used are available in the QlikView Mashups Microsite. and tagged Integration, Mashups, QlikView 10, QlikView 11, Workbench. Bookmark the permalink. Both comments and trackbacks are currently closed.